Back in Narshe, the village Elder is finally convinced that it’s too late to mimic Switzerland. We head off to the mountains, where the villagers have hidden the Esper, to take our stand. Along the way, we get some character interactions, huzzah! Hey…Ed? 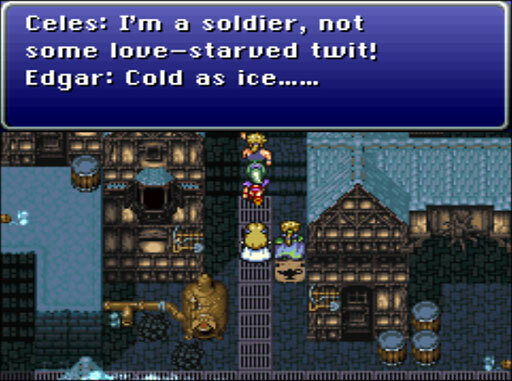 You just said that Locke isn’t interested, so why is Celes “cold as ice” for not being interested? 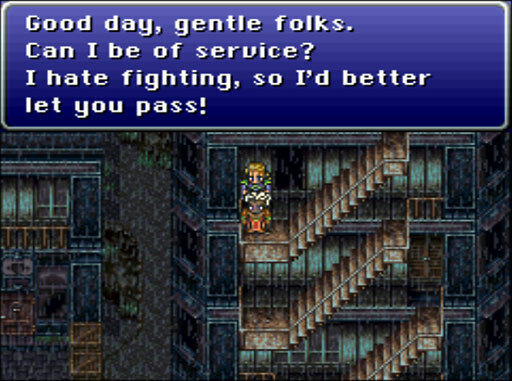 (But I love Celes’ “Dammit, Jim, I’m a soldier, not an X” lines.) 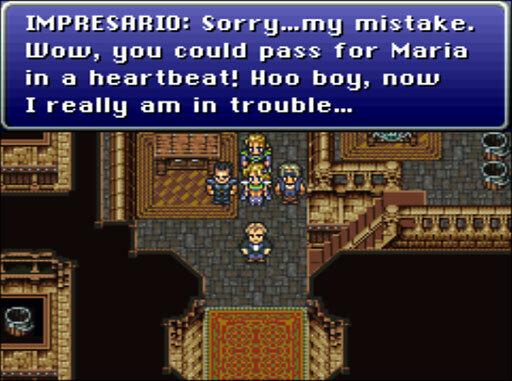 The GBA script changes Edgar’s line to, “So much for my next suggestion…” which makes a lot more sense, considering his reputation as a flirt. Also, surely there’s more pressing things to discuss with a military officer with intimate strategic knowledge of the enemy you’re about to fight? Celes Backstory Dumps that she was infused with mako Magic as a baby, raised as a Magitek Knight. This is all very interesting. Here we have two people, both raised by the empire, but one was given a position of authority and is comfortable with magic as a gift, whereas the other was abused, enslaved, and now views magic almost as a curse. 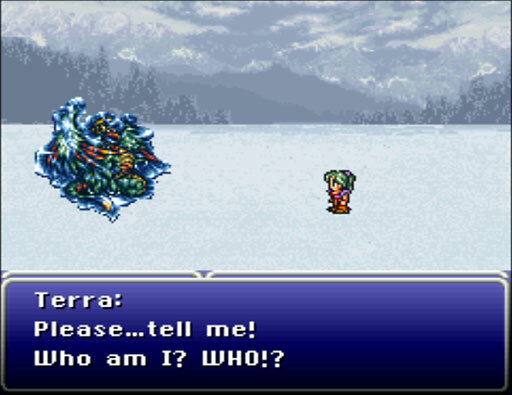 I’m interested to see how Terra responds. *facepalm* Annnnnd we’re back to “Female character, love interest Y/N?” Seems like the guys don’t get quizzed on this half as often. As we reach the field of battle, Cyan’s paranoia bursts out again. 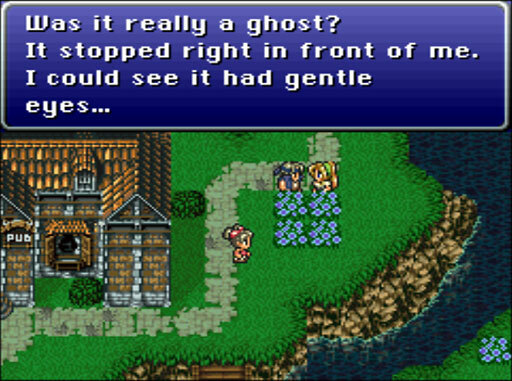 Frankly, while I like Celes (and her spiffy white cape), I approve of his caution. 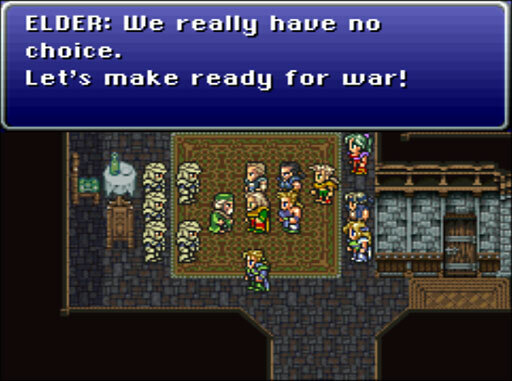 Is she opposed to the war, or just Kefka’s despicable methods (poison, slaughtering civilians, etc)? Does she feel so betrayed and bitter about her imprisonment that she’s striking back at the empire? Is she a traitor to her emperor? 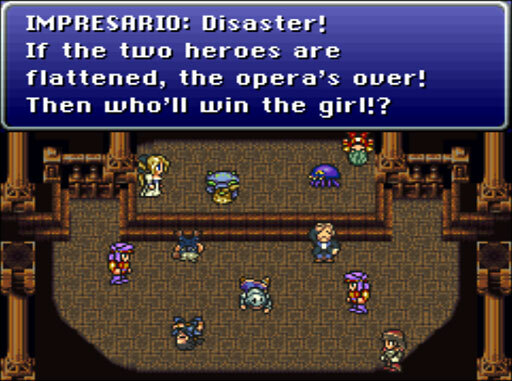 Or, again, is she opposing Kefka, but still a loyal general at heart? Has she truly joined the Returners’ cause? Why? Not simply out of gratitude to Locke, surely? 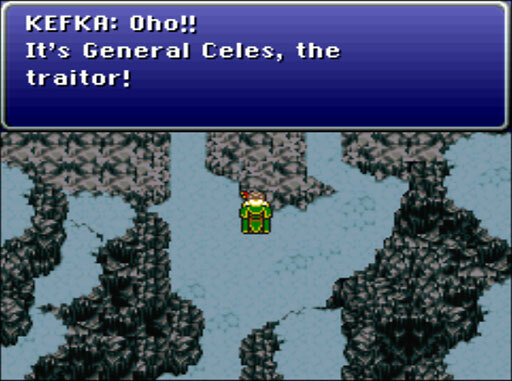 Carrier pigeon note to Emperor Gestahl: that’s the second or third time I’ve seen Kefka express delight at someone turning traitor. Why are you still trusting this clown? 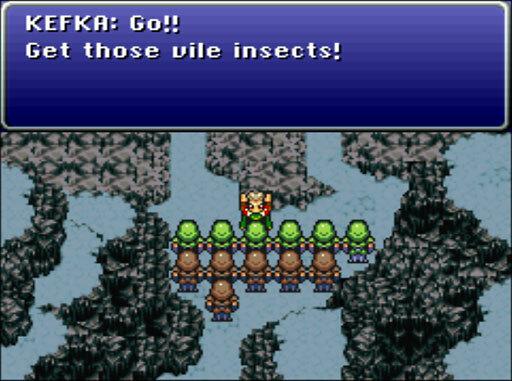 Then Kefka, whose goal seems to be to slaughter as many people as possible, sends his hapless minions towards us like sheep across a minefield. He has no problem representing Absolute Evil. No problem! At this point, we are a human buzzsaw. 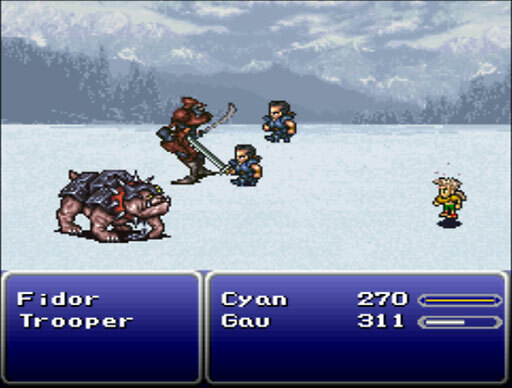 I love to use Gau & Cyan as a Kimahri & Auron tag team. Mowgli Boy is devastating, since I’ve stocked him with all the strongest Rages (mostly multi-target abilities), while Cyan can crack open a single foe like a walnut or do Quadra Slam if the need arises. 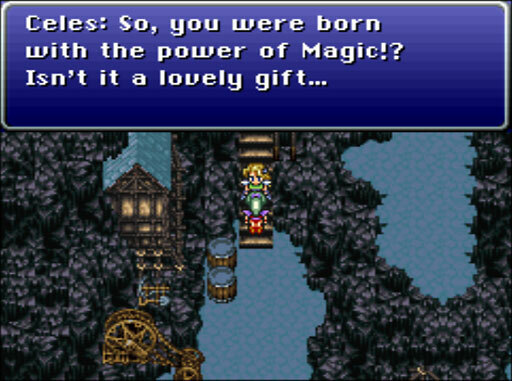 So, despite magic being a “lovely gift,” despite her position as General, she felt enslaved, too? 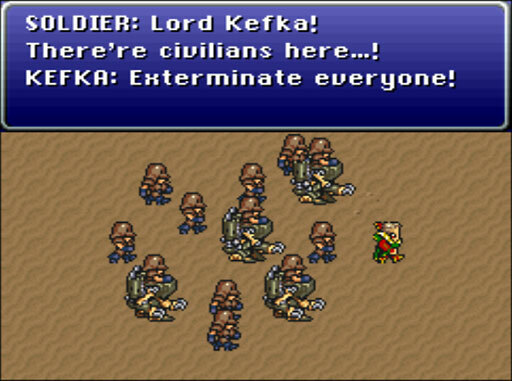 I actually replayed this entire sequence because the first time, I was beating my head against the interface and couldn’t figure out how to assign cursor-Terra to an attack group. 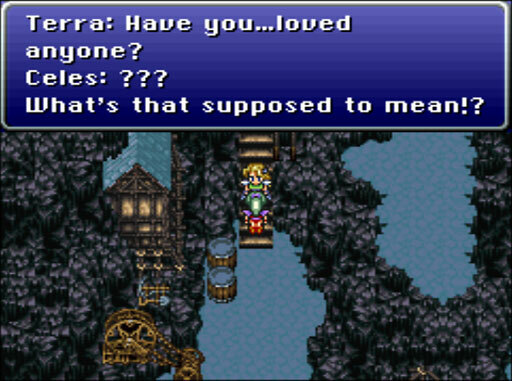 But I wanted to see if she had any special quotes during the showdown with Kefka. 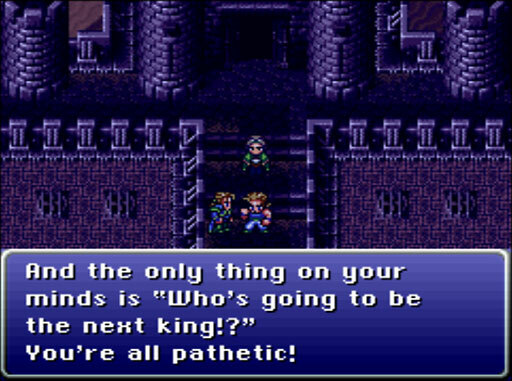 (Other than “Kefka….he stuck that crown on me?” —nope). 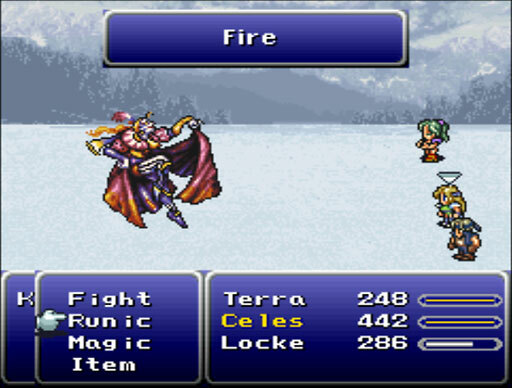 Unfortuntely, I forgot that Celes’ awesome Runic Blade ability neutralizes any spells, including Terra’s. Oh, well, we still thrashed him. 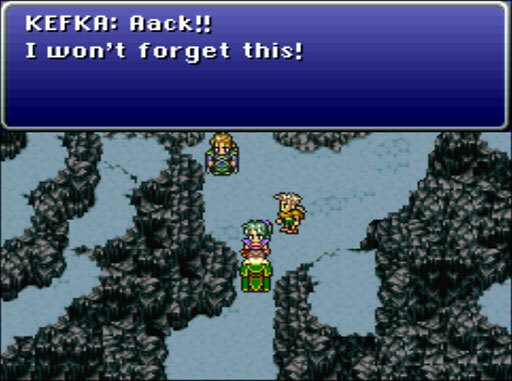 Kefka flees like a Gilgamesh, sans snappy dialogue (at least in the Playstation version). 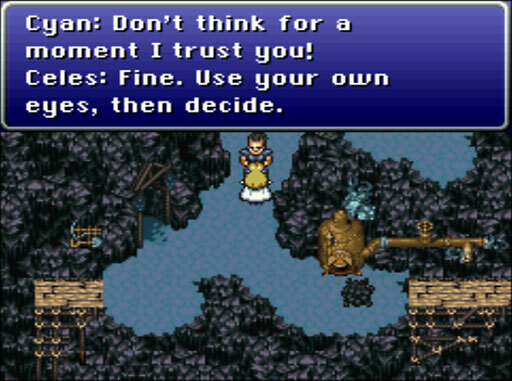 So we’re finally free to do what Edgar and Banon have been agitating for since they first met Terra: use her to communicate with the Esper and enlist its aid. 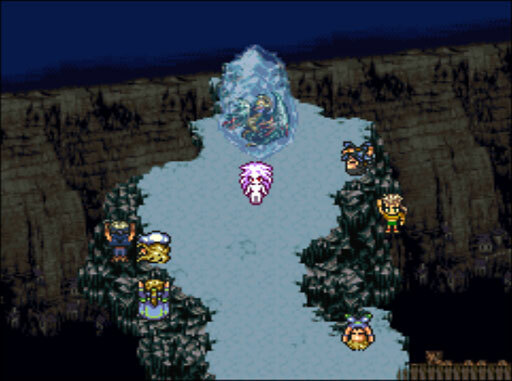 We all gather around the frozen Esper, which Narshe Village has placed at the very edge of a precipice. I’m sure this will go over well. So to speak. The Esper starts glowing and making *twingle twingle* noises again. 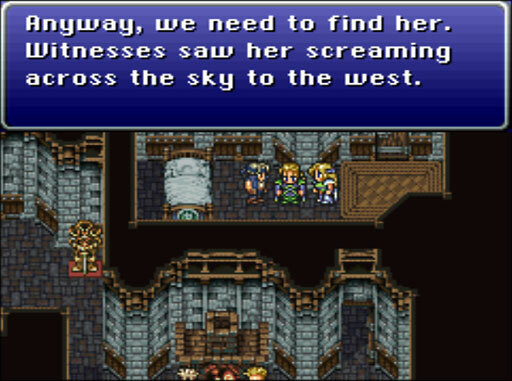 Terra shouts “Nooo!” and does the Stagger Step of Mindfuckery (which we’d all recognize if we saw it on the street, who says that fantasy games and SF haven’t taught us anything). Terra walks towards the Esper, hypnotized. The girl can’t get a break; something is always messing with her head. “What!? What am I feeling? What’s going on?” she asks in a tunnel vision landscape in which the rest of the party has vanished from her awareness. 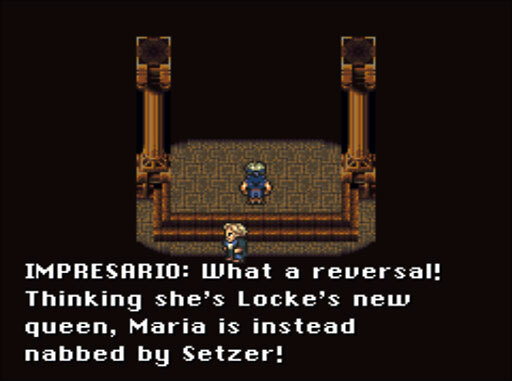 Sure enough, as I had predicted back when Banon first proposed this harebrained scheme, the Esper zaps Terra again. LEARNING CURVE, WHAT IS THAT. When the lightning fades, Terra transforms into…. Shiva?! 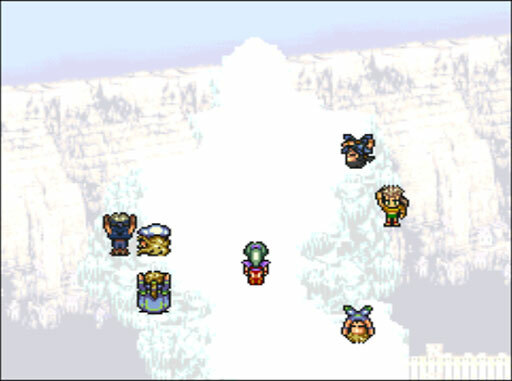 In one of the more heartbreaking, memorable, and downright terrifying moments in the whole Final Fantasy saga, Terra rises into the air with an inhuman scream and flies off. She races over the world at breakneck speed as if trying to flee from her own body. (I would liken it to my first cat’s reaction to having a bell tied to his collar, but that’s a totally un-epic analogy). The scene changes. We’re back in the house where Terra first awoke. 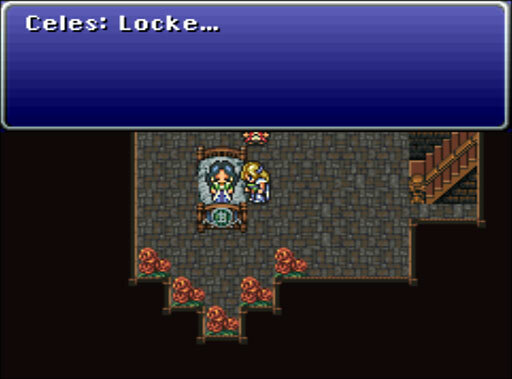 In a touching inversion, it’s Celes looking after Locke. 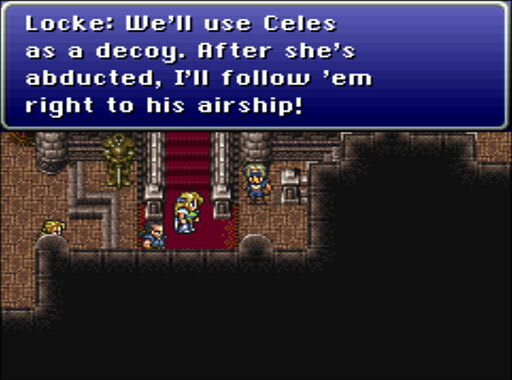 Locke, playing the part of amnesiac, asks Celes to fill him in. “She changed into a… something, and…took off. 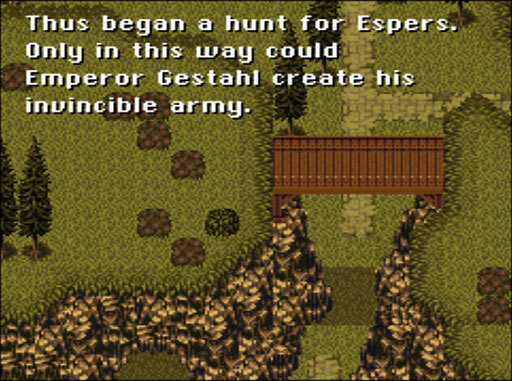 She looked like…She looked like…an Esper…good lord that’s a lot of ellipses, isn’t it?” Celes explains. “Screaming across the sky.” Brrrrrr. I’m once again struck by how the good guys’ words contain seeds of ethical ambiguity. 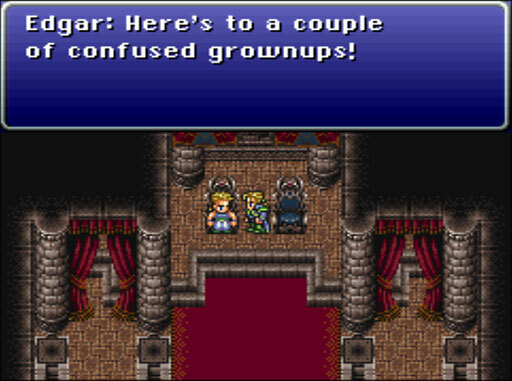 Edgar is genuinely concerned for her, but he doesn’t say, “She needs our help,” but rather, “We need to find her.” I’m still waiting for Terra to become agent, rather than object, of a verb. We divide the party, leaving a few behind to guard Narshe. 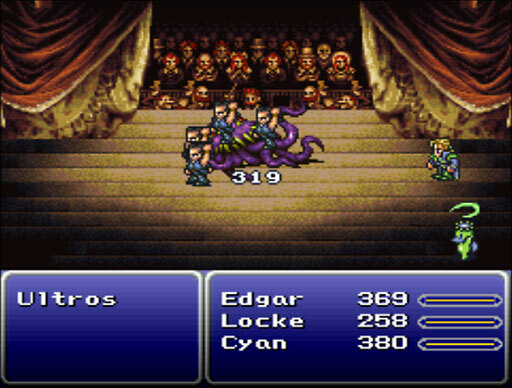 I reluctantly part ways with my two tanks and head south with Celes, Locke, Sabin and Edgar. 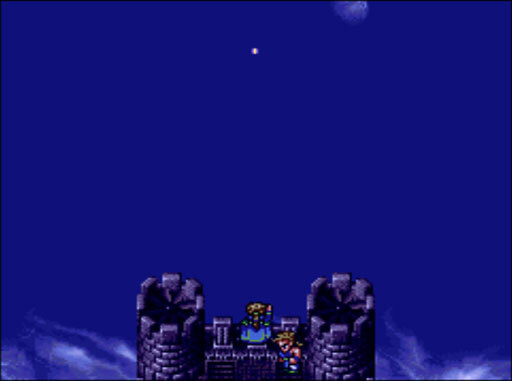 We stop by Figaro for the night, the kingdom that Sabin left to his brother to rule. “No one cared when Mom passed away, either!” he snits. 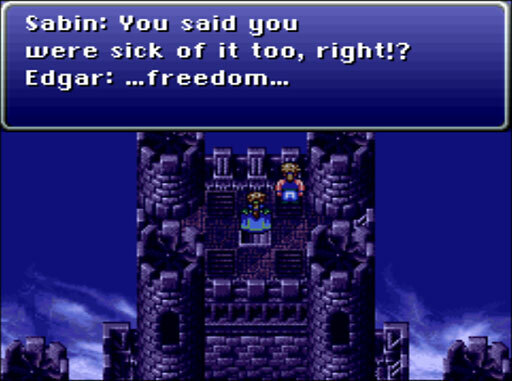 Edgar follows him up to the battlements, where Sabin threatens to leave this “war-sick realm for my dignity and freedom.” Was Figaro fighting a war with the empire back then? I’ve never been quite sure whether Figaro was a conquered vassal state or feigning an alliance to avoid being attacked. “This one’s for Dad!” Edgar says in the flashback, which promptly ends. 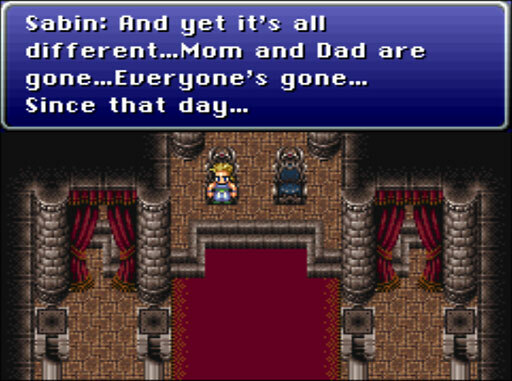 Back in the present, Edgar pops out and says, “And then, you opted for your freedom,” letting us know that Sabin won. Well, that was heartwarming. Now It’s time to bug the chief engineer and teleport Figaro’s Moving Castle across the mountains. On the far side, we stop by the village of Kohlingen checking for rumors. A little girl describes “That shining creature! So frightening to us all! But I found it…beautiful!” Terra’s making quite an impression. In the basement of a nearby mansion, things suddenly take a macabre turn. The treasure turns out to be Rachel, the woman Locke couldn’t protect. 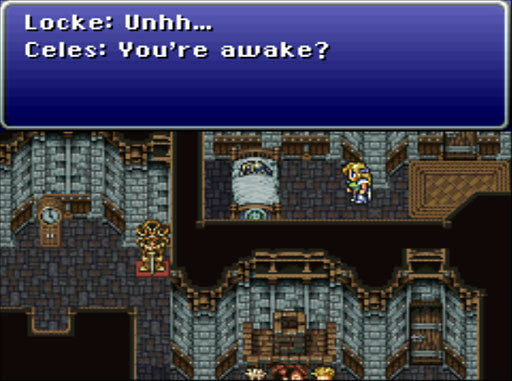 Locke mourns at her bedside. Flashback time! From Locke’s earlier comments, I assumed (mea culpa!) that Rachel was a Distressed Damsel, imprisoned and tortured to death by the Empire. 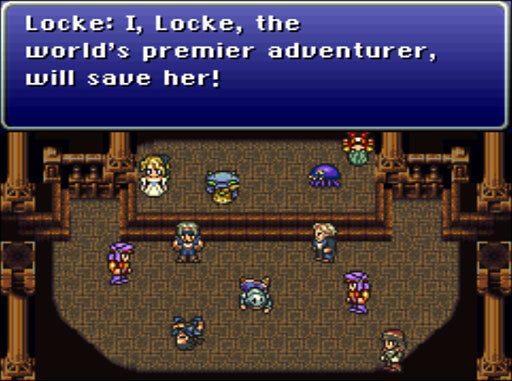 It turns out that they were a treasure hunting team, and she saved Locke’s life by pushing him to safety from a crumbling bridge and taking the fall in his stead. 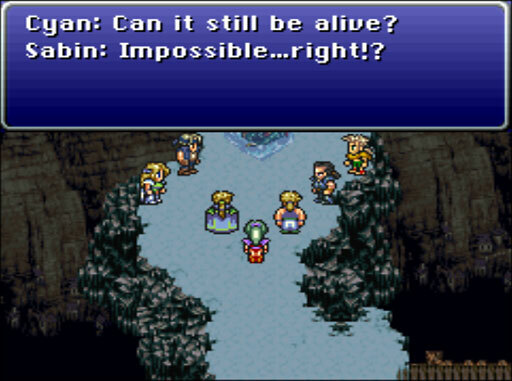 She survived but lost her memory (no wonder Locke glommed onto Terra). Her father, furious, drove Locke away, and Rachel herself told Locke to stop hovering around her, no doubt egged on by Dad. 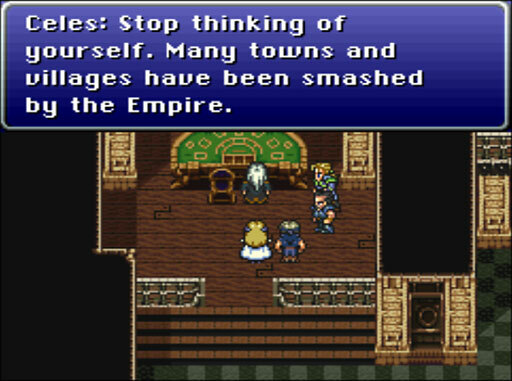 While Locke was gone in self-imposed exile, the empire attacked Kohlingen, killed her parents and mortally (?) wounded Rachel. The last word she spoke was Locke’s name. This means that Locke’s rogue/thief persona hides a grimmer truth: he’s searching for a “treasure” that will revive his love. I suppose that’s better than locking himself in a coffin and moping, but (obscure reference is obscure) I can’t help thinkig of One-Eye being preserved on the point of death in Elfquest. In sum: Ick. At this point, Locke seems to have lost hope. “I…failed her…” he tells the other party members, and slumps away. 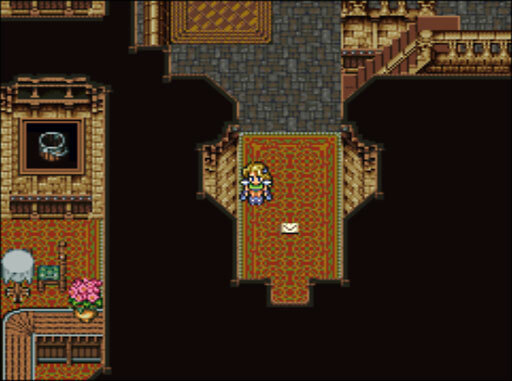 The party follows, but Celes hangs back for a moment with Rachel. 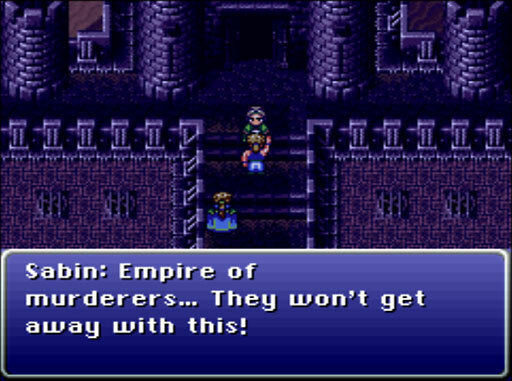 I wonder if Celes feels some responsibility… was it her troops that attacked Kohlingen? 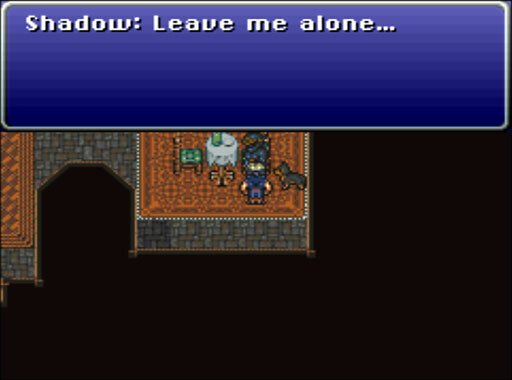 Shadow’s hanging out in the bar. “We meet again,” he says. He’s probably still pissed that we knocked him out and dragged him onto that nightmare train. Fair enough. Down south, we stop by the high-class of Jidoor and stock up. Wealthy locals make disparaging comments about the poor people who left to settle up north. Classism, much? Edgar: *cough* I beg your pardon? 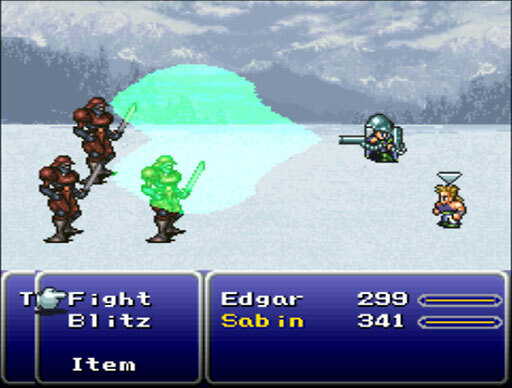 Sabin: Hey, Bro, I always said you were the pretty one! We wend our way north to Zozo, the village of “poor” people, which really is dismal, dark, raining, full of murdered bodies on the streets and thieves and ruffians. Stereotyping much? At the top of a nightmarish block of apartments, we find a surprisingly cordial person standing in the rain. Gentle folk? Is this a joke? You just saw my Celes with Genji Glove beating the insulation out of a Hill Gigas with flail/cutlass, didn’t ya? Inside the penthouse, we find Terra a little worse for the wear. 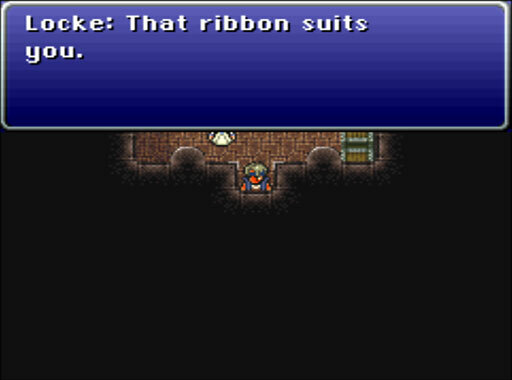 Uh, SURE, LOCKE. It’s perfectly all right to get turned into a glowing screaming non-human when you didn’t know you weren’t human! 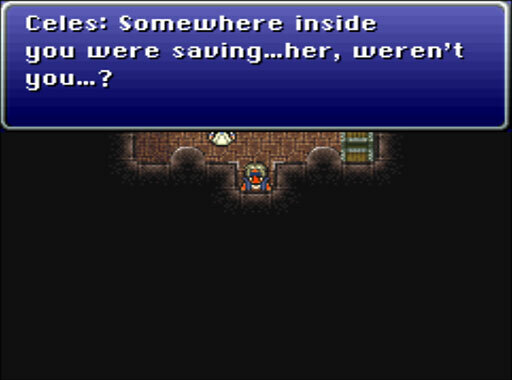 Terra awakens, lurches around the room, and collapses in the corner. 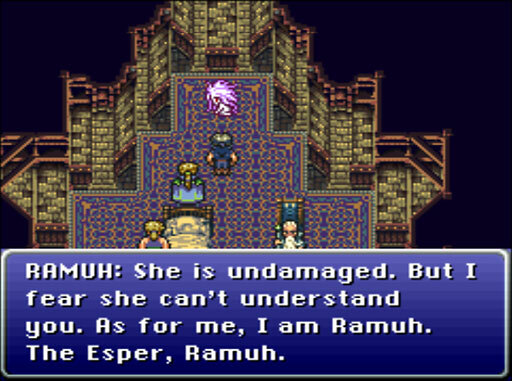 They are shocked to learn that Ramuh is an Esper. Don’t Espers live in the feymarch another world? 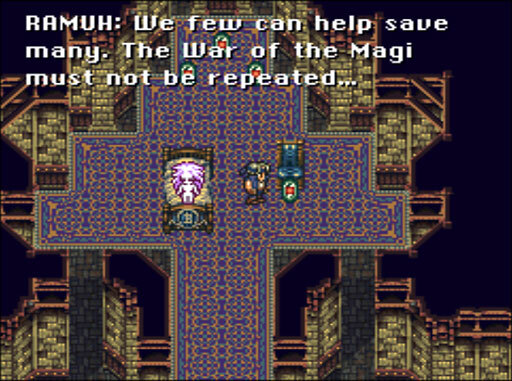 Ramuh tells of the War of the Magi from the Espers’ perspective. They created a new world (nice trick!) and fled there to escape exploitation. 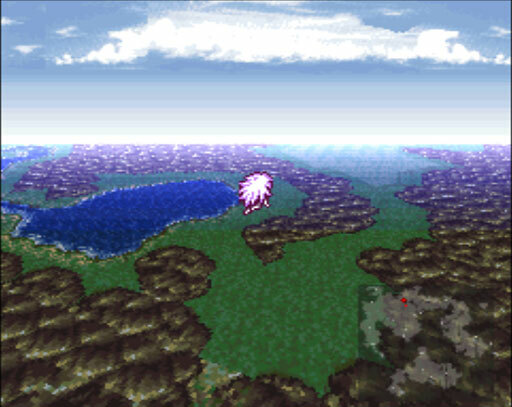 However, 20 years ago, humans seeking Magitek power discovered their hiding place. Ramuh laments that many Espers have been trapped in the Empire’s Magitek Research Facility, being drained of their powers. He escaped, rescuing a few of their crystals. Hey, Locke? Have you tried holding her hand? Making comforting noises at her? Talk to her, mebbe? But no. 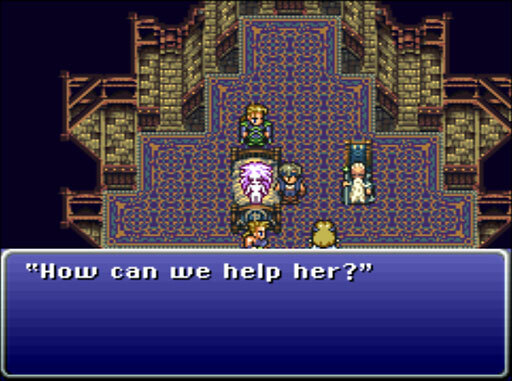 Ramuh sets us on a quest to rescue the imprisoned Espers, in the hopes one of them can calm her. 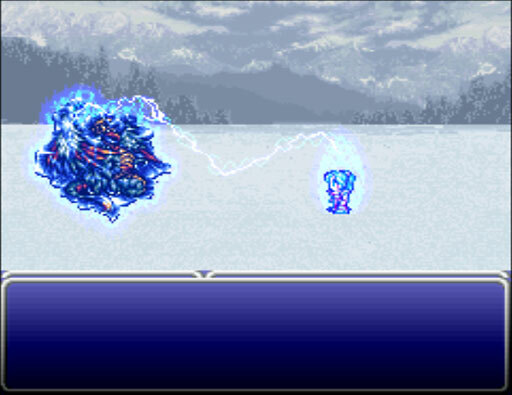 Ramuh sacrifices himself, and the last of his power transforms into magicite — a creepier substance than in FFXII, since it’s distilled from living beings (more like Mako). He also bequeaths us the other Esper crystals he saved from the Magitek Facility. Cyan and Gau have caught up with us — gee, hope Narshe is safe —and we fill them in as we descend. 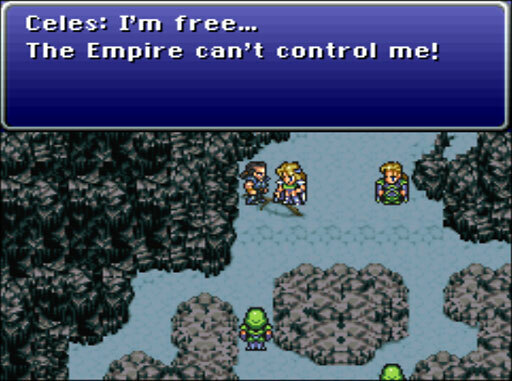 Celes shows visible distress at the revelation that the Empire has been draining Espers for Magic. The party divides once more; guarding Narshe is a good excuse for the party members that can’t come along. (I’m missing my back row, dangit). The resident Impresario — how did he get off the Phantom Train? 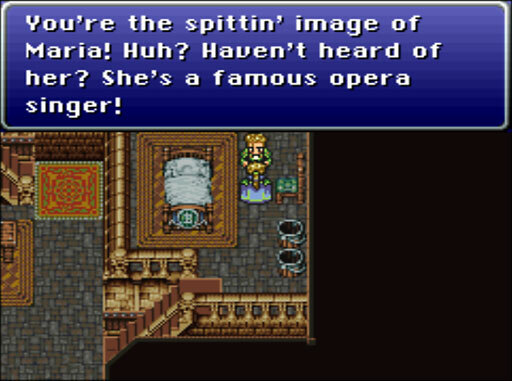 — is in a tizzy and mistakes Celes for the famous opera singer we’ve been hearing about. Oops, sorry. We’ll just sit back and enjoy this “identical twin” comic opera, shall we? 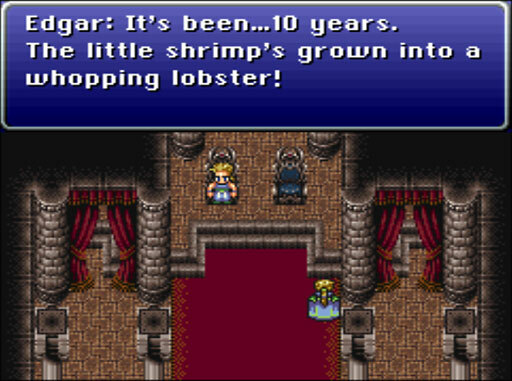 Final Fantasy is at its best when its characters are suddenly thrust into show biz. 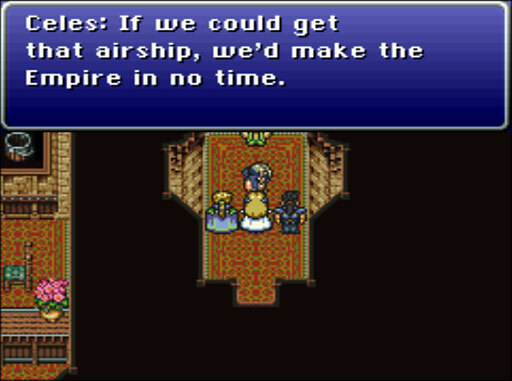 When Locke inquires about the identity of our “Wandering Gambler” (“You born on a farm, son?” says the class-conscious Impresario), we get our first glimpse of Setzer posing at the prow of his airship. 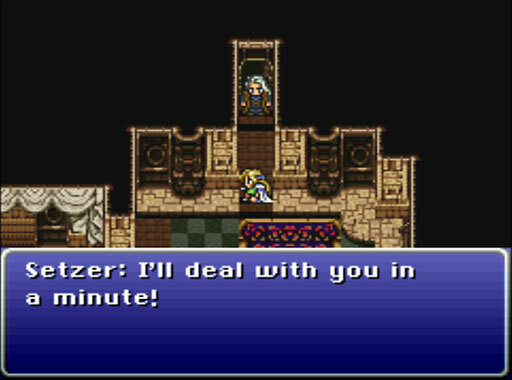 Am I the only person who played these games out of order and thought of Setzer as a campy AU!Sephiroth? I barely resist the temptation to use Seph’s name. I’m not particularly a Sephiroth fan, but see the comic potential. Hey wait! 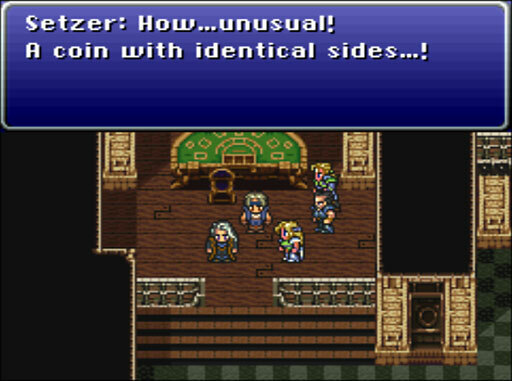 Why isn’t Setzer named “Cid”? Is that allowed? 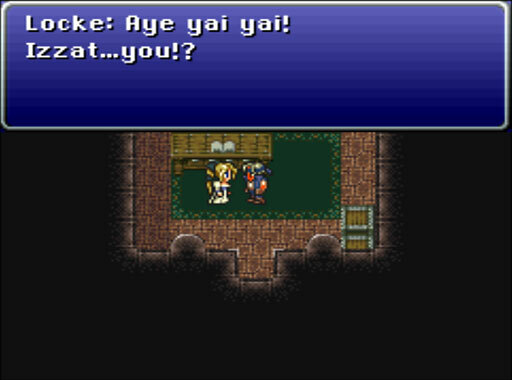 We head south to the opera house, where Locke has a plan. However, she heads into the back to practice. And now we move to the level of WTF farce. Oh, you again. He drops off a letter which they fail to read. 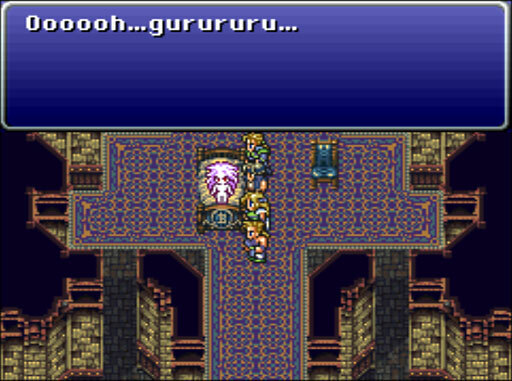 I would be amused if Ultros’ cunning plan goes thud. 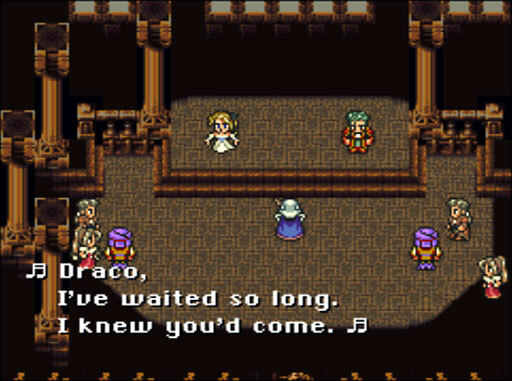 I saw Uematsu’s “Draco and Maria” performed live at a Final Fantasy: Distant Worlds concert at Comic-con a few years ago. 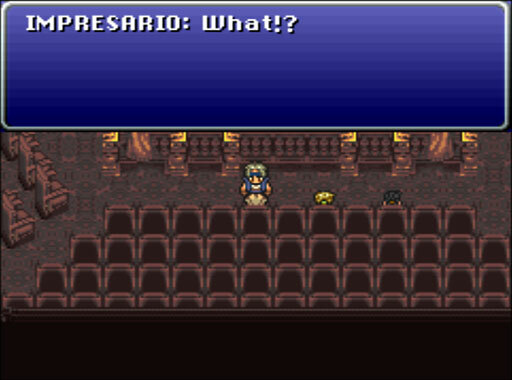 Here’s a fan’s mashup of this scene’s game graphics synched to the incredible Distant Worlds recording. 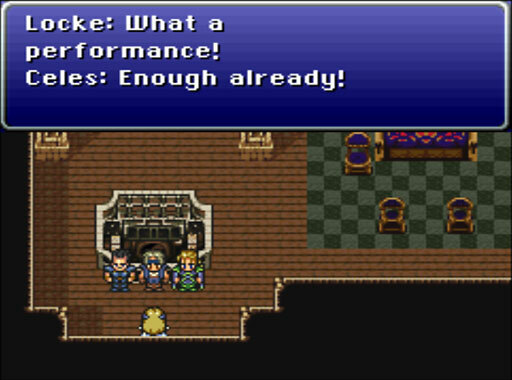 Of course, the performance doesn’t go off nearly as smoothly in-game. 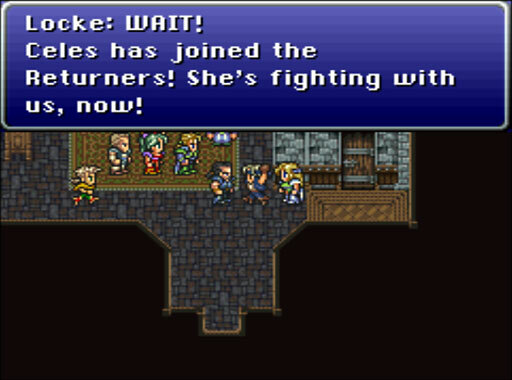 Locke barges into Celes’ dressing room (!) to help her memorize her lines. 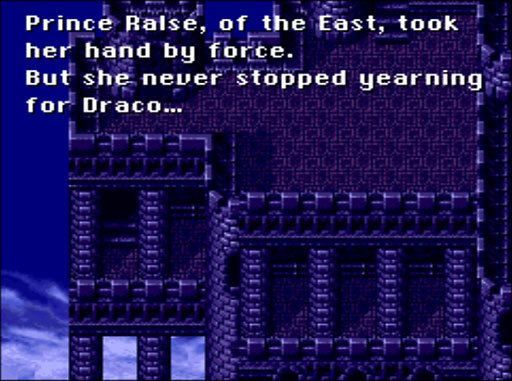 Dang that two-timing Prince Rasler! Seven years before FFX debuted voice acting (apart from occasional vocals on FMV soundtracks), FFVI found a clever way to suggest singing with simple sound processor tricks. It sounds like someone gargling the tune, but it works. 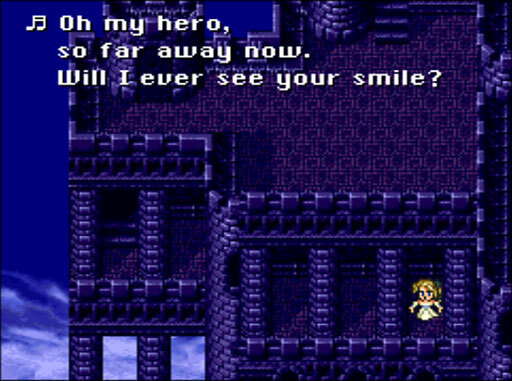 Celes throws herself into this imaginary romantic role with gusto, despite her scorn for “love-starved twits.” Her playacting seems to inform some of her later behavior in the game, as if the Maria persona rubbed off on her. Ultros gets in on the letter-writing act. 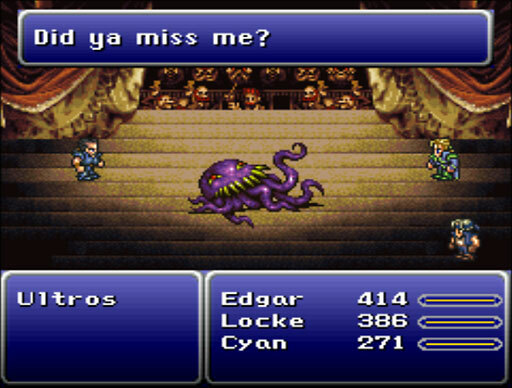 The Impresario begins to have second thoughts about Locke’s sanity when he hears there’s a purple octopus sending threatening missives, too. The Draco & Maria libretto serves as a charming handbook of clichés that one should never use in writing. 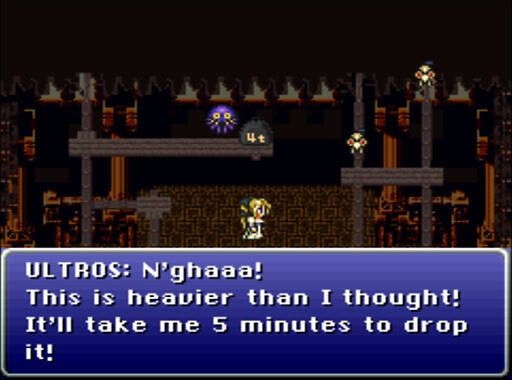 In the opera house rafters above the stage, Ultros prepares to drop a 4t weight. Oh, lor. So this is all a buildup for Locke to play white knight again. 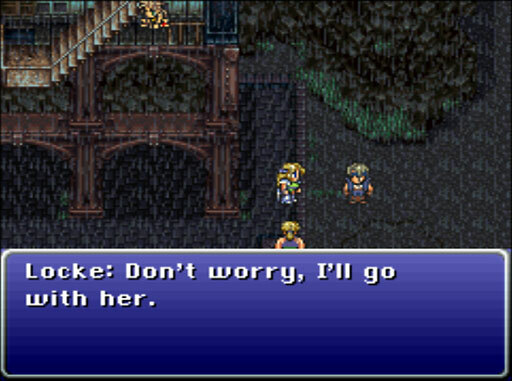 Locke, honey, she’s a Magitek Knight who can probably fry calamari without even raising a sword. 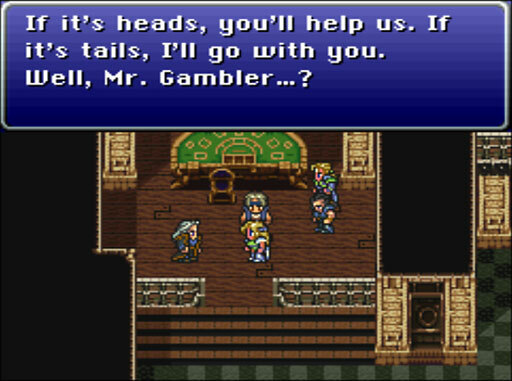 And you need some debonair style tips from Balthier before you embark on a “leading man” acting career. “can never defeat me!” or words to that effect. This just gets crazier and weirder. 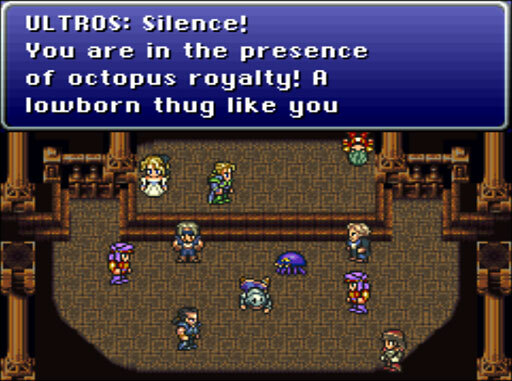 Worse, the evil octopus villain keeps reminding me of poor Paula Tiso (FFX Lulu voice actor) playing Laughing Octopus in Metal Gear Solid. I keep imagining Ultros’ lines in her voice, and it’s terribly, horribly wrong. No, actually, I was pining for Rubicante, or at least Gilgamesh. 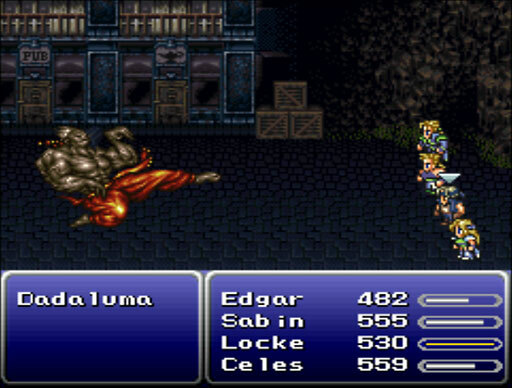 HEY WAITAMINUTE WHERE’S CELES AND HER GENJI GLOVE? Argh. 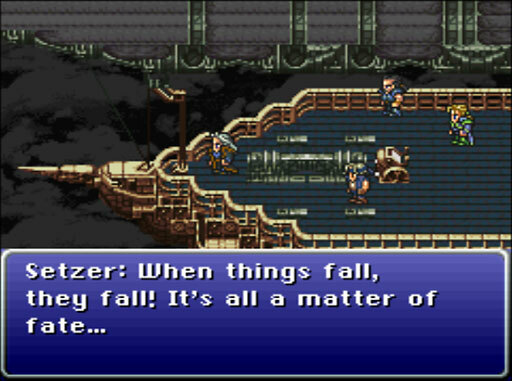 Setzer drags Celes — a Magitek-enhanced soldier, mind you — back to his airship and thwacks her down the steps. I’d like to think she’s just playing along here. Celes takes advantage of game mechanics to store the rest of the party in her hip pocket help the party climb up a rope through a conveniently open hatch. 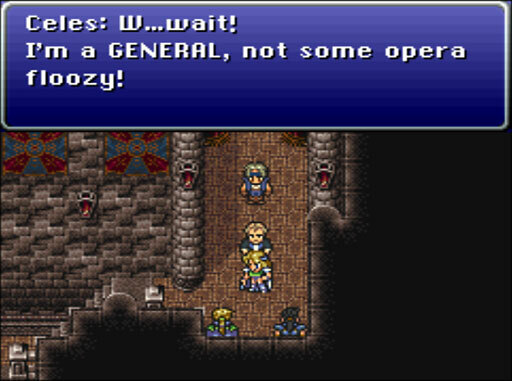 Setzer is none too pleased to find his lounge occupied by a fake Maria plus strangers. 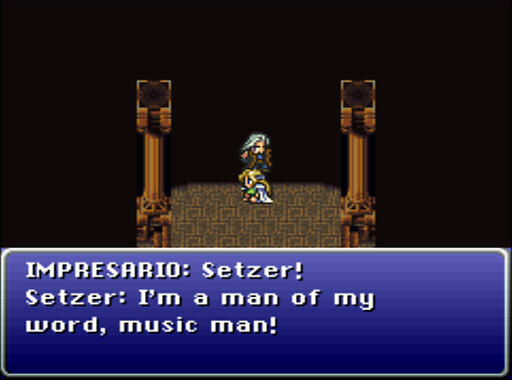 This is news to Setzer. As far as he knows, the empire is warm and fluffy and rescues kittens from trees. Oh, sure. Oh fer cryin out loud. 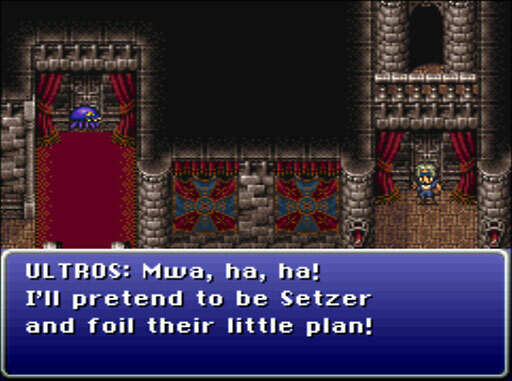 He says he’ll only help if Celes marries him. Celes is still blushing from Setzer’s “you look stunning” comment a moment ago. I just noticed that Edgar is blushing, too. Heh. Tangent time: Despite my giving Edgar a hard time, I really like the guy: thoughtful tactician, competent ruler, inoffensive flirt, gadgeteer with automatic crossbow. His fake coin raises my opinion of him 500%. He must’ve suggested the coin toss to give Sabin an out, instead of being saddled with co-rulership. With anyone else, it would’ve been a power grab, but for Edgar, it was actually an act of generosity to let his brother abandon familial duty (a big thing in Japanese culture, remember) while saving face. 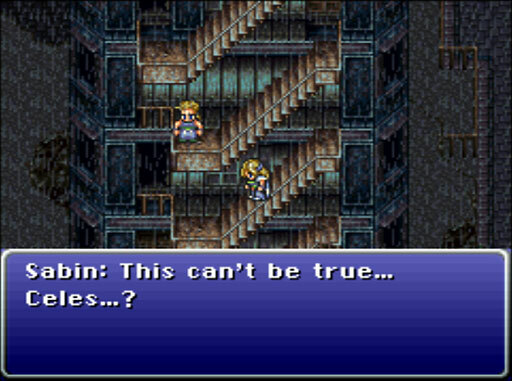 Now, here’s a question: I’ve read that the coin features Sabin’s and Edgar’s profiles. Was it struck in anticipation that they’d both rule as king? 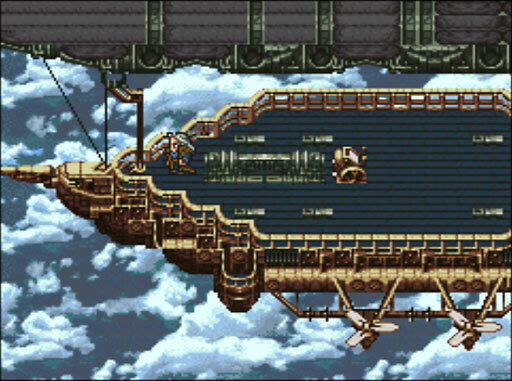 Back in the present, Setzer gives in with,”I have nothing to lose but my life!” and we adjourn to the flight deck. Outside, Locke is having second thoughts about anime physics: “This unwieldy-looking ship really moves! Could it crash?” Of course it can, Locke! This is Final Fantasy! And off we go. Setzer’s ship, the Blackjack, sets course for the imperial base on the southern continent. Aw, heck. I knew I shoulda grabbed Gau. WAIT! I need my berserker fireball-caster! Turn this ship around! Nevermind. The Path of Plot Advancement beckons. Tune in next time, when I hope to get poor Terra back in the party! 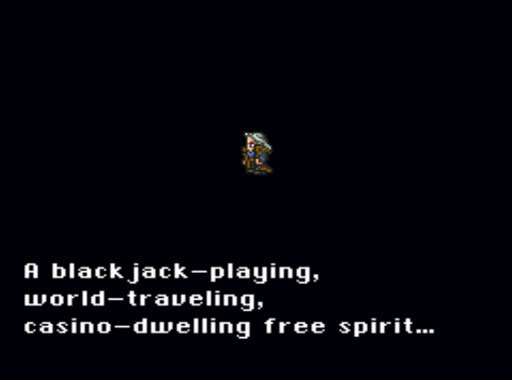 This entry was posted in Final Fantasy VI, Let's Play... and tagged airship, crystal stasis, distressed damsel, ffvi, playstation 1, possession is nine tenths of the law, ship happens, showbiz. Bookmark the permalink. 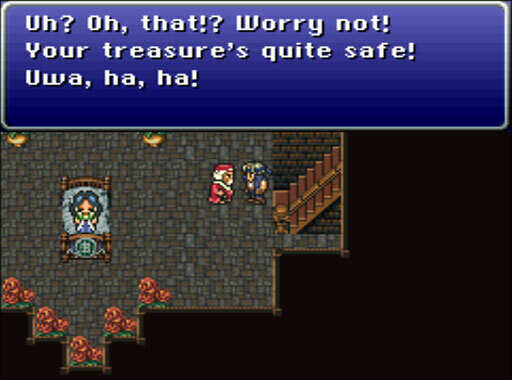 ← Final Fantasy VI Recap, Ep II: Are We There Yet? 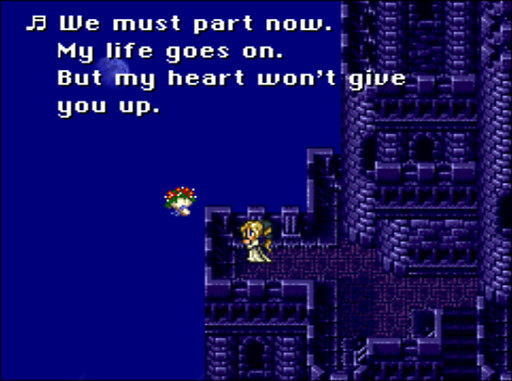 You said that you were dissapointed that there was no little dialogue between Kefka and the party at the battle of Narshe. 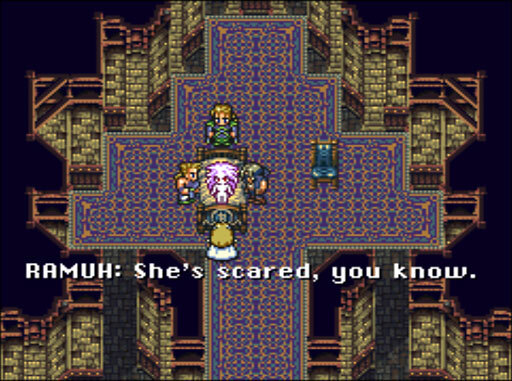 If I remember well, there is one or more in the gba version (and it changes with your party leader). Oh, thank you so much for the comment! 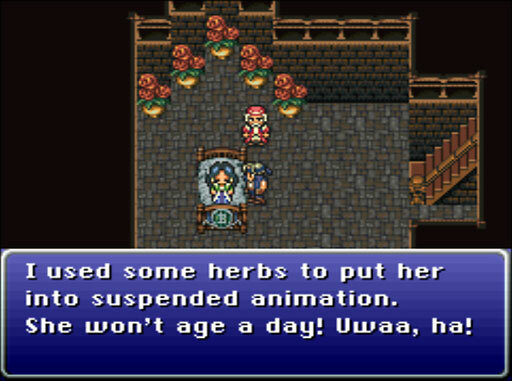 I need to keep checking that GameFAQ copy of the GBA script to see what I’m missing; it’s so much of an improvement on the PS1 version.